Open wounds or cut in tissue (lacerations), scrapes (abrasions), and puncture wounds can be caused by bites or by other mechanisms. Wounds that are not caused by bites and are clean and quite small usually heal fast without any problems. However, some wounds can cause extensive blood loss. In some wounds, deeper structures, such as nerves, tendons, or blood vessels, are also injured. Other wounds can become infected. A piece of foreign material (such as a splinter, glass, or a clothing fragment) can also remain hidden inside a wound, causing later problems such as infection. Shallow cuts to most areas of the skin rarely bleed much and often stop bleeding on their own. Cuts to the hand and scalp as well as cuts to arteries and larger veins often bleed vigorously. Infection can build up when a wound is contaminated with dirt and bacteria. Although any wound can become infected, infection is particularly likely in deep scrapes, which grind dirt into the skin, and in puncture wounds (particularly those resulting from animal or human bites), which introduce contamination deep under the skin. Wounds that contain foreign material frequently become infected. The longer a wound remains contaminated, the more likely it is that infection will develop. Wounds can be painful at first, but it will lessens the pain after the first day. If a wound affects a nerve or tendon, the patient may be unable to move the body part fully. Some nerve injuries cause weakness or paralysis, loss of sensation, or numbness. If foreign material remains inside a puncture wound, the part of the wound near the material is usually painful when touched. Pain that becoming worse a day or more after the injury is usually the first sign of infection. Later, an infected wound becomes red and swollen. A fever may also develop. 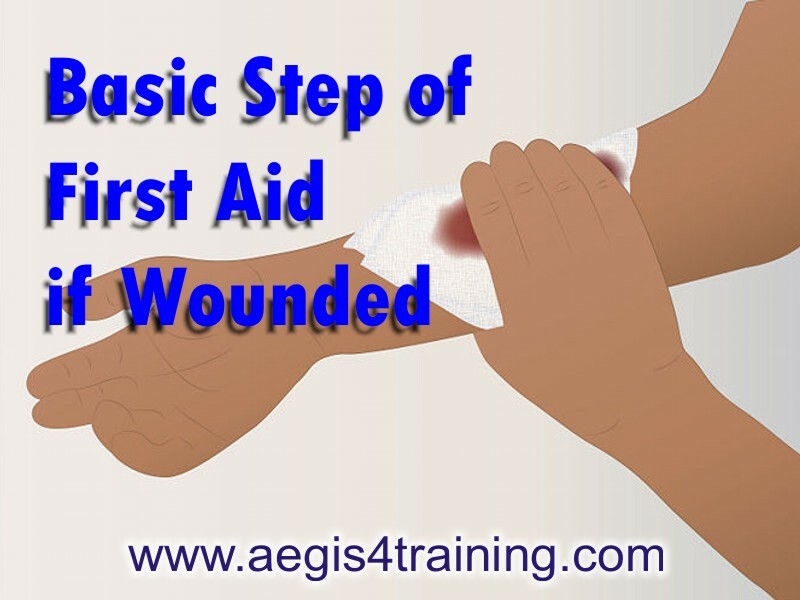 The first step in treating a wound is to stop the bleeding. Visible bleeding can almost always be stopped by firmly compressing the bleeding area with a finger or hand for at least 5 minutes. Whenever possible, the bleeding part is elevated above the level of the heart. Because tourniquets shut off all blood flow to a body part and deprive it of oxygen, they are used only for very severe injuries (such as combat casualties). To avoid infection, dirt and particles are removed and the wound is washed. Large, visible particles are picked off. Smaller dirt and particles that cannot be seen are removed by washing with mild soap and tap water. Dirt and particles that remain after washing often can be removed with a more highly pressured stream of warm tap water. Harsher agents, such as alcohol, iodine, and peroxide, are not recommended. These solutions can damage tissue, impairing the capacity to heal. Scrubbing is required to clean deep scrapes. If a wound is very small, it can be kept closed with certain commercially available tapes. Stitches may be needed for deep or large cuts. After cleaning and, if necessary, closing the wound, antibiotic ointment and a bandage are applied. All kind of wounds, whether treated at home or by health care practitioners, should be assessed for symptoms of infection during the first several days after treatment. If any symptoms of infection develop, medical help should be sought within several hours. Small wounds heal within a few days. Visit our first aid page here!